Hi! Welcome to Simon Says Stamp's Color of Fun Blog Hop. Yesterday, a whole load of delicious new goodies were released from Simon Says Stamp, and today I am joining in the celebrations. You should have arrived from Nichol Magourik's blog. If not, head to the Simon blog to start at the beginning. My card today features the beautiful leaves in the One With Nature set were just crying out to be watercoloured. I added a sentiment using the fun Grunge Alphabet set, and chose some matching green paper from American Crafts' High Five pad to frame my design. A trio of Moonshine sequins add a tiny touch of sparkle. Take a look at the full Color of Fun release HERE. It's another fab release!! Simon Says Stamp is giving away a prize package on every stop of the hop. Aren't they kind!! Leave a comment here by June 15th to be in with a chance of winning. And be sure to comment on EVERY stop! The new SSS kit looks so fun with all those happy colors. Great card! Simple but striking! Lovely card - thanks for sharing! Very pretty color combo with the kraft. Love these watercoloured trees images! It´s a fun release, I really like all of it. I must be the BIGGEST fan of leafs!!! LOVE them, LOVE them, LOVE them in this collection!! Beautiful job!!! A beautiful stamp set and you have showcased it beautifully with this CAS card. Thank you for a chance to win some of these wonderful new products. 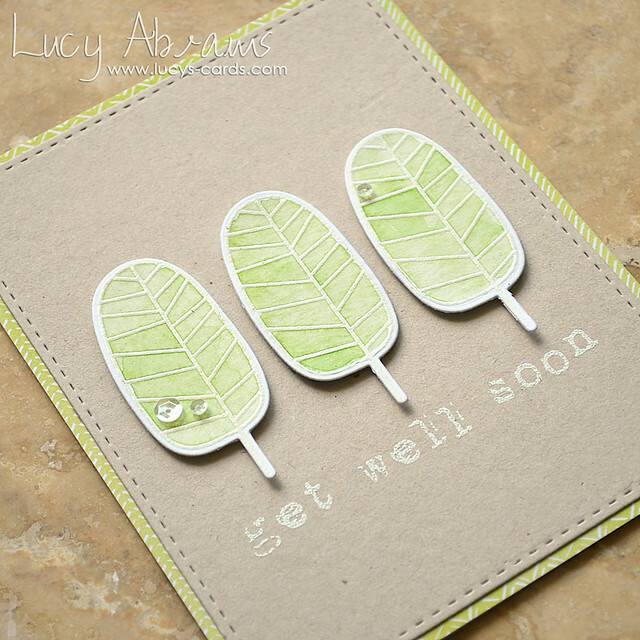 The leaf stamps are so versatile with their simple line design! Love the watercolouring you have done on those nature pieces. So pretty and soft. Like the CAS style. Like the use of the recycled card eco-natural to complement the nature theme. This is so pretty! Love the CAS design. Love those grungy letter stamps. And yesterdays shaker card with the carousel horse is being pinned because it is so beautiful. This is a lovely card! Love your creativity! Love your card. More I see this stamp set, the more I want it! Adorable!! loving the new inks, I want to win this so badly!!! Love the soft colors of your card. Perfect for a get well. Lovely card! The new ink colors are fantastic! TFS! A very simple but BEAUTIFUL design! Beautiful! I love that font, it works so well with the craft!! This is really pretty. The watercoloring adds the right touch to the leaves. Very pretty. I love the colours of your leaves. This new SSS release is so fun. love it! The craft cardstock pairs perfectly with those trees. The new ink colors are my favorite! They are all yummy! Your card is wonderful. Nice clean lines and great color combination. Love the way you colored the leaves! You definitely made me fall in love with this set! Love this card! Such a clean design that comes together with eye catching effects! I must remember this idea for my next card creation! Really like your use of the distress alphabet! Striking card. I love the grunge alphabet. This new release by SSS is awesome. Love the colors of inks. The stamps are a must have. Thanks for participating in the blog hop. Fabulous card with the leaves. Love it! This is so pretty! And I love that color green! Love the colour combination of Kraft card stock and the green. My new favourite! I just love these trees! Thanks for the chance to win! Such a very pretty card and pretty color!! I love your card! The leaves are great...just a change in color and you can use them for any season! So versatile! I like the colors of your leaves but that stamp set is just not understanding to me. LOL. I guess it's over the old ladies head. So many great items.....would LOVE to win them!! Simple and great!Love this card. Love the stamp set and card. I just got my Zig Clean Color Real Brushes-hope for the watercolors next month. The carousal horse is so much fun! Such a simple but elegant card! Thanks! What an elegant design! Thanks for giving me some great ideas!!! I love the Asian look of this beautifully simple card. I LOVE this, so elegant and simple!! Thanks for sharing. Great simple and elegant card! Thanks for sharing! your card is stunning!!! love the way you put it together! Your cars and that stamp set are amazing! Such a simple and elegant card! Perfect for sympathy. I adore your use of color and simplicity! It looks stunning! Just lovely, really. The soft greens are perfect for this! Such a pretty, clean & simple card. I love it! So pretty! Love the watercolor on the leaves/trees. Lovely! I love the simplicity of this card. Love the colour choices. Pretty water colors. Love the sequin accents. Like how clean & simple your card is. Very nice card. It would make anyone feel better! Stunning and delicate! Love the feel you've achieved with this card. Pretty card. I really like the green with the kraft paper. Love this graphic modern set. Very funky. Love this stamp set! Pretty card! Beautiful card. Can't wait to get my hands on these new stamps! Thanks for sharing. Great card, love the clean and simple style. What a nice card. Mthank you for sharing. Beautifully simple card! Love the soft green of the trees. What a lovely card. There's something about those leaves that is strikingly simple. This release is so yummy. Lovely card. Just perfect for a get well card. Love the softness and subtleness of the colors and the design. Cute card. I am loving the new release. Really love this new stamp set! You've used it perfectly! Cute card and the new inks are simply beautiful. Just love those colors, match beautifully with the craft and background papers. Lucy, your work is great! I love your Happy birthday Carousel card. Love this - Simple & beautiful. Beautiful card! I will definitely be trying to watercolor these images when I get this set in the mail. Lucy, I like the soft natural look you achieved with these new products! pretty card! love those leaves! Using the recycled eco-natural cardstock...great idea!! Love the card and the new colors are gorgeous! Love the watercolored look! I think I need this leaf set. Thanks for sharing your card. I love your card. It's simple but so pretty! Love your sweet card. The water coloring looks so pretty! Love the funky look of the new stamp set! So fun! This is my very favorite set out of this release - so modern and lovely! Beautiful card. Thanks for the inspiration and the chance to win. Really cute card! Love those little trees, looks great with the kraft/green! Beautiful card. I love the watercoloring and the soft color. This issuch a pretty card! Thanks so much for sharing it! Fab CAS Card, Lucy! Love the soft coloring. So sweet! Love the soft coloring on the trees and the sprinkle of sequins. This has been so much fun looking at all the different designs. Everyone is so unique! After this blog hop I am in love with this stamp set! This is a lovely, simple card. Beautiful and simple card. I love clean cut, simple cards. So classy. I really enjoy clean and simple and LOVE your color choice! The watercolouring looks just fantastic here! Just so pretty! Love your cards Lucy!!!! These soft colors on kraft are just lovely! So clean, organic and pure looking. My kind of card. 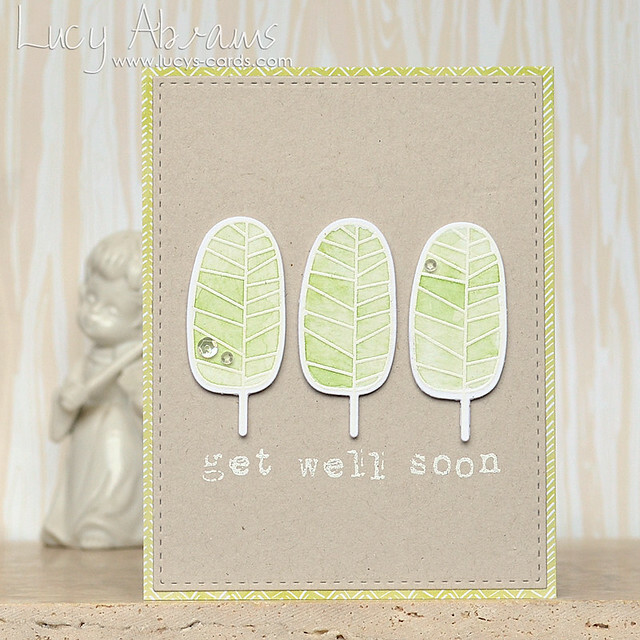 Beautifully soft colors for this lovely card - perfect for sending your get well wishes! Nice cards - Love the summery fun inks! Wow, the new ink colors are FABULOUS!!! Lovely card. Love the die cut leaves. Such a pretty and clean card. Lovely. liking those leaves more and more! You were right - those trees look fabulous watercoloured! Beautiful! Wow! I love how soft this is! Lovely card - love the simplicity and the printed paper frame. Such a beautiful card!! This release is amazing!! Love the new SSS releases. It's so fun to see all the different ways of using them. I love your card, it's simple but so elegant!! the sequins add just the right touch. thank you. I'm loving this tree set! Great card. Your card is beautiful loving the soft look of the trees! I am so glad you used watercolor for this new One With Nature set! Awesome card...love the color combination. Nice card to give to a man or women. Love the look of simplicity. The sequins are a nice touch! Very nice card....great natural look with stamp and colors. Fabulous release - love it! Wonderful card! What a great card! That stamp set is one of my new favorites! Thanks for sharing! I love how earthy and simplistic this card is! Love the watercoloring you did. Great stamp set and the sequins are so pretty. The sequins really add to the beautiful card! I really love these leaves. This is a beautiful card. Gorgeous card, love all the details, kraft CS and stitching, just gorgeous! I love this One with Nature stamp set. Fantastic card! Love this stamp set! Great card! I love the sentiments from the One with Nature stamp set and can't wait to buy the Gansai Tambi watercolor set!! Love all the attention to detail... from the colors to any of the added sequins or other pieces. Very sweet card....it would perk up anyone not feeling well! Thanks for sharing!!! Super cute creation, Lucy. Thank you for sharing with us! Very pretty card, Lucy, so simple and serene! I love those leaves! What an amazing, elegant card! Love the One with Nature set and your card totally rocks it! Such a wonderful clean card. Superb! so very simple but so very stunning!!! Very simple, but still beautiful! Such fun stamps ! I can see myself doing a lot of different designs with those stamps incorporating some handrawn art with the stamped designs. Such a simple, pretty card. My favourite kind! I love the stamping on kraft cardstock and I love the grunge stamps they go perfectly with the leaves and kraft cardstock. All around GORGEOUS!!! Love your carousel horse card. I love the cards you made with the grunge alphabet. Great job! Gorgeous card Lucy, love the addition of the sequins, like a little raindrop! Thanks for sharing it. Loved the watercolored leaves. Loved the card!